Do you feel self-conscious about your skin’s textural irregularities from scarring (acne or otherwise), wrinkles, fine lines, and/or unwanted pigmentation? While there are many options – medical spa treatments and pharmaceutical grade products – can bring you closer to smooth skin, there is one option that can dramatically improve a person’s skin in just one procedure – chemabrasion. Most people will see a 70-80% decrease in wrinkles and a 50% (or greater) improvement in scars. At the Cosmetic Surgery Center in Santa Barbara, we combine a medium depth chemical peel with a light to moderate depth dermabrasion (note: dermabrasion is not the same as microdermabrasion) in our chemabrasion procedure. Together they remove and smooth the top layers of the skin. Chemabrasion is often done on the entire face, although in can be performed in areas such as around the eyes (to address crow’s feet), the mouth (to address smoker’s lines), or the cheeks. Most people are relieved to find out that general anesthesia is not necessary for the procedure. Local anesthesia in addition to oral sedation alone (or in combination with intravenous sedation) is sufficient to make a person feel comfortable, relaxed, and unaware. We stress that post-procedure wound care is essential to get the maximum benefit. The skin must be kept clean and well hydrated to prevent crust formation. The skin will initially be pink, but will gradually less in 1 to 2 months. Mineral make-up and physical sunblock (such as TiZo) may be starts when the new skin has regrown, usually 5 to 10 days after the procedure. View some of our before-and-after Chemabrasion photos. 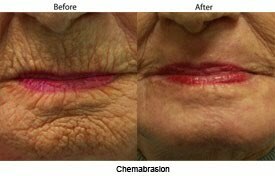 Call (805) 563-0000 to schedule a consultation at Cosmetic Surgery Center for Chemabrasion skin resurfacing. According to the annual report from the American Society of Plastic Surgeons, there were almost 1.8 million cosmetic surgery procedures last year (a 1% increase from 2016) done in the United States. Any of the procedures listed above with a clickable link are those that we perform at the Cosmetic Surgery Center in Santa Barbara. Contact us today (online or at 805-563-0000) to schedule consultation. Fine lines, wrinkles, acne scars, “liver” spots (skin discoloration), and saggy skin are all factors that can affect a person’s appearance. While there are aesthetic procedures and physician-grade skin care products that can help alleviate the above issues, the process may take a long time and the results may not be as dramatic as one would hope for. Since I have been a cosmetic surgeon in Santa Barbara for more than three decades, I have seen and worked with many products and aesthetic procedures dedicated to skin resurfacing and the procedure that gives the most optimum result is Chemabrasion. Chemabrasion is a skin resurfacing treatment that combines a light to moderate dermabrasion (not to be confused with microdermabrasion) with a medium depth chemical peel. This procedure is done in the operating room, but general anesthesia is not required. Instead we use local anesthesia in addition to oral sedation alone or in combination with intravenous sedation. This is sufficient for comfort, relaxation, and unawareness. Most people take 7 to 10 days off from work after the procedure. To maximize the benefit of the chemabrasion, post-procedure wound care is an important aspect of the healing process. The skin must be kept clean and well-hydrated to prevent crust formation. Some people experience an initial pinkness to their skin which will gradually lessen in 1 to 2 months. Mineral make-up may be started 8 to 10 days after the procedure. The results are noticeable. Wrinkles may be decreased by 70% to 80% and acne scars see about a 50% or greater improvement. It is an ideal procedure to treat skin irregularities, facial wrinkles, acne pits, photo damage, facial scars, pre-cancerous lesions, and early skin cancers. Call my office (805-563-0000) – Cosmetic Surgery Center in Santa Barbara – to schedule an appointment to talk about chemabrasion or other cosmetic facial rejuvenation procedures. Are you interested in bringing back the youthful skin you once had? Many lotions and potions claim to be the next fountain of youth but realistically we know that their results may be temporary or that they simply don’t work at all. If you want to do something that can dramatically improve the appearance of your skin then consider having Chemabrasion done by Santa Barbara cosmetic surgeon Dr. Terry J. Perkins. As we age, our skin loses collagen and elastin, leading to sagging and relaxation. Further breakdown of collagen and elastin is accelerated by sun damage (UV exposure) causing the skin to weaken and wrinkle in the areas that are moved by muscles of facial expression. Smoking and genetics also play a role in the appearance of wrinkles. Chemabrasion, a skin resurfacing procedure, addresses wrinkles and a number of other skin issues including acne scarring and pits, skin irregularities, facial scars, pre-cancerous lesions and early skin cancers. The unique procedure of Chemabrasion combines a light to moderate dermabrasion (not to be confused with microdermabrasion) with a medium depth chemical peel. General anesthesia is not required, but local anesthesia in addition to oral sedation alone or in combination with an IV sedation is sufficient for comfort and unawareness. Most people will see a 70 to 80 percent decrease in wrinkles and a 50 percent (or greater) improvement to acne scars. 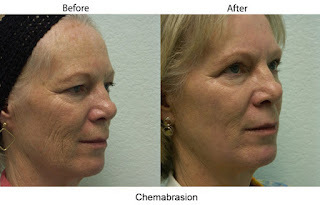 See before-and-after pictures of Chemabrasion done by Dr. Perkins on his website. If you are interested in Chemabrasion, call Dr. Perkins’ office to schedule an appointment – 805-563-0000. If you are like most Santa Barbara locals, you have been getting ready for beach time, pool parties, and taking pictures to capture all the memories with your family and friends. But are your wrinkles, skin discoloration or acne scarring making you feel camera shy? Santa Barbara cosmetic surgeon Dr. Terry Perkins offers Chemabrasion as a solution to helping you achieve a more even complexion, tighter skin, and lessen the severity of wrinkles and acne scarring on your face. Chembrasion is a skin resurfacing treatment that will give you optimum results for skin rejuvenation and wrinkle reduction. Chemabrasion combines a medium depth peel with a light to medium dermabrasion. Downtime is usually 5 to 9 days (more for deep wrinkles or acne pits) and patients often see some degree of skin tightening too, so early jowling/sagging or skin laxity is also improved. Chemabrasion is skin resurfacing for aging faces that addresses wrinkles, sun damage and uneven pigmentation. Watch this video below to meet Santa Barbara cosmetic surgeon Dr. Terry Perkins and to schedule a chemabrasion consultation with him, you can call the Santa Barbara office at 805-563-0000. Our cosmetic surgery highlight this month is Chemabrasion. If you are in search of skin rejuvenation and wrinkle reduction, this treatment will give you a 70 to 80% improvement. Santa Barbara cosmetic surgeon, Dr. Terry J. Perkins, combines a strong chemical peel with a deep dermabrasion for the chemabrasion procedure. Downtime is usually 1 to 2 weeks but the results are dramatic and amazing! Call Cosmetic Surgery Center at 805.563.0000 to schedule an appointment with Dr. Perkins. For November, Cosmetic Surgery Center Santa Barbara is highlighting chemabrasion. If you are in search of skin rejuvenation and wrinkle reduction, and looking for optimum results, you’ll find one of the best treatments in the operating room called chemabrasion. Chemabrasion combines a medium depth peel with a light to medium dermabrasion. Downtime is usually 5 to 9 days (more for deep wrinkles or acne pits) and patients often see some degree of skin tightening too, so early jowling/sagging or skin laxity is also improved. Chemabrasion is skin resurfacing for aging faces that addresses wrinkles, sun damage and uneven pigmentation. Schedule a chemabrasion consultation with Santa Barbara cosmetic surgeon Dr. Terry Perkins at 805.563.0000.